Botox is a prescription medication injected into the muscles and used to improve the look of moderate to severe wrinkles enhancing a more youthful look. Botox gives you a more rested and relaxed look and actually prevents wrinkles. Both men and women are starting BOTOX even in their 20’s and 30’s to “buy time” against aging. Wrinkles gradually progress with age, stress, and sun exposure. The earlier a person starts using Botox, the more preventative it can be. Any healthy individual with moderate to severe wrinkles could be a candidate for Botox. Botox treats moderate to severe frown lines between the brows, forehead, and crow’s feet. It softens vertical lines of the upper and lower lip, and bunny lines on the nose. Botox is a Quick and minimally invasive procedure with no downtime. Dr. Atkin’s gentle touch while injecting Botox allows for little discomfort. Results can begin to appear within a few days of treatment, however, improvement continues for up to two weeks. Results can last up to 4 months after the procedure. Repeated treatments every three to four months will prolong the results and slow down the aging process. Botox can be considered preventative medicine because it helps to reduce the formation of lines and wrinkles. Millions of Botox Cosmetic injections are performed each year, safely and effectively, with very few side effects. 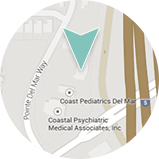 Dr. Atkin personally performs each procedure at Dermatology and Laser of Del Mar. As a Board-certified dermatologist with years of experience, Dr. Deborah Atkin considers your expressions and the muscles in your face to formulate her approach. Her expertise ensures a more natural and longer lasting result. Call or email us today at 858-350-7546 to schedule an appointment.